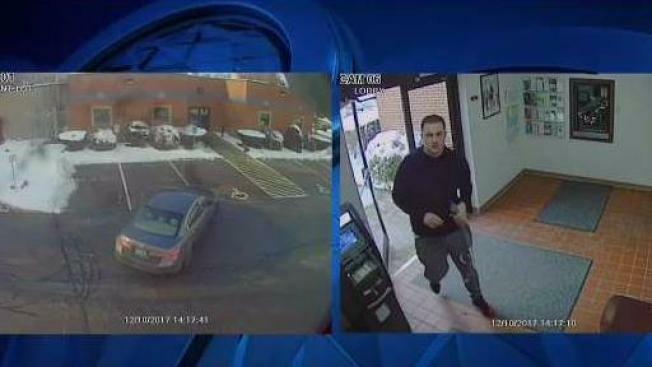 Police in Goffstown, New Hampshire are searching a man caught on camera leaving an unknown substance and threatening note in the police station lobby. Police in Goffstown, New Hampshire are investigating a suspicious item that was dropped off in the police station lobby Sunday afternoon. According to Goffstown police, security cameras captured a young man approaching the police station carrying a 12-ounce soda bottle around 1:15 p.m. Once in the lobby of the station, footaged showed the man place the bottle on the table with a note suggesting the bottle contained hazardous material. The suspect then left the building without making contact with police, authorities said. Officers found a brown-colored liquid inside the bottle. The Goffstown Police Department was placed on a temporary lock down until the New Hampshire State Explosives Disposal Unit arrived and rendered the area safe. Officers remained able to answer calls for service as the suspicious liquid was safely secured. The contents of the bottle remain unknown at this time. Further testing will be done on the liquid, said police. The suspect can be seen in security footage driving a dark grey Honda Accord with New Hampshire license plates. Goffstown police are requesting the public's assistance identifying the suspect captured on camera planting the water bottle. Anyone with information can contact Lt. Hammond at (603) 497-4858.